Ford GT no. 48 was sold Saturday at Mecum’s Indianapolis sale for an incredible $1.65 million after a frenzied bidding war that progressed quite rapidly. Crossing the dais in under two minutes, the bidding started rapid fire in Mecum’s traditional livestock auction-style cattle rattle, and nearly as soon as it started, it was over. You can see in the video below, posted to the beistheman YouTube channel, just how quickly that bidding went. Whoever the seller was, he made a boatload of cash on his initial $450,000 investment, as the car sold for more than three times its original MSRP. We have reached out to Mecum and Ford for comment, but are still waiting on replies. We will update you as the situation unfolds. Perhaps even more strange, the seven-mile Ford was sold across the auction block at $1.65 million. The auctioneer was asking for $1.7 million, but never got the bid. Mecum has claimed the sale as a “hammer price of $1.7 million,” which is just plain not true. Hammer prices do not include buyer premiums, which are paid after the fact (usually around 10 percent, not including taxes and title transfer fees). It is not clear if this is an outright lie to inflate the sale, or a simple misunderstanding. With only 500 cars available, Ford’s initial customer agreement was quite strict. 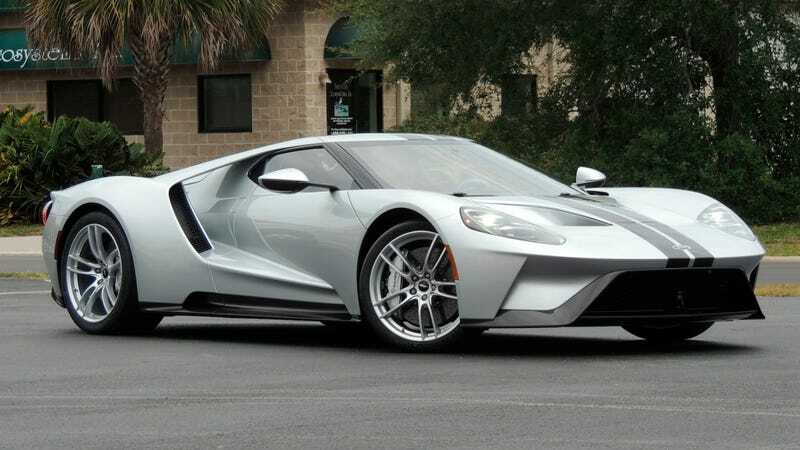 Ford expected GT buyers to be “brand ambassadors” for a minimum of two years, and baked that into the contract of purchase. You’ll likely recall a very public back and forth between Ford and pro wrestler John Cena regarding whether or not it was legal for Cena to sell his GT before the time limit. Cena sold his GT, Ford sued Cena, Cena filed a motion to dismiss the lawsuit, and it’s still kind of embroiled in courts. Perhaps this black-over-silver sale can provide precedent for Cena’s case, and get it all over with finally. If a court has decided definitively on the side of Ford GT owners, it is possible we will see a number of these low-mile turbocharged V6 hypercars hit the auction block this summer. Time will tell.